It’s definitely more fun in the Philippines—to quote the Department of Tourism’s new marketing slogan—because the country is always alive with the many festivals going on in some part of the country somewhere. 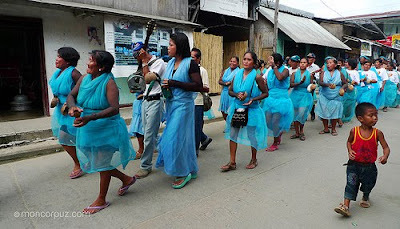 Most fiestas are still steeped in the Catholic tradition—celebrations of a city or province’s good fortune believed to be accorded by a patron saint. Then there is the devotion to the Virgin Mary in all her incarnations, and her son the Baby Jesus or Santo Niño, like the Sinulog festival in Cebu and the Ati-Atihan festival in Aklan, both of which will culminate today. Also worth mentioning is the grand annual celebration of Tondo, Manila, fiesta also to Santo Niño. There are also the festivals that celebrate a town’s founding anniversary, or its native products. Whatever the basis for the merrymaking, you can bet on a lot of food served, overflowing drinks, much singing and dancing, and contests in all shapes and forms. Costumes and parades are also de rigueur for a number of the festivals as well. But there are a few festivals in the country, which are still not too well known by the majority, and have odd or unusual beginnings. Down South, in Surigao del Norte, the municipality of Malimono pays homage to human-sized monkeys said to have existed in the coastal area even before the time of the Spaniards, by celebrating the Onggoyan Festival. In fact “Malimono” got its name from the mischief and mayhem caused by the monkeys. Legend has it that the monkeys (“unggoy”), seeing human beings perhaps for the first time, plotted and stole the food and personal belongings of a group of Spanish travelers when night fell. The next morning, finding themselves bereft of belongings, the leader of the group cried “mal mono” (bad monkeys) in disgust. The natives, however, thought the monkeys were gods, according to the Provincial Tourism Office. 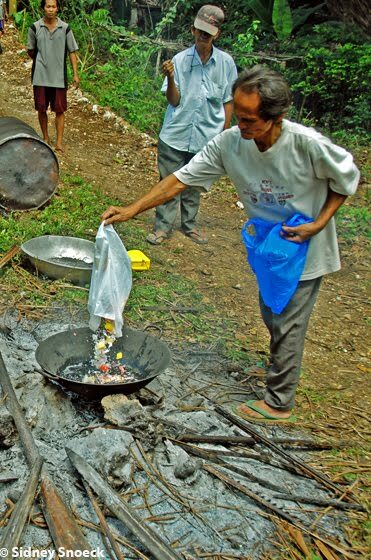 So every May 15, the residents of Malimono make offerings to these monkey gods by preparing their favorite foods like bananas, cassava, etc., in the hope that the mischievous ones leave the residents alone. While the festival is held intermittently due to scant financial resources, when the event is mounted, people go around dressed up as monkeys, and play tricks on neighbors. Tricks are played by one family on their neighbor, there is a lot of singing and dancing, and people tell stories or mount plays based on the lives of the monkey gods. Local products are also on display during this festival, as street dancers go around imitating the movements of monkeys. If Surigao del Norte has its mischievous monkeys, Nueva Ecija has its mud people. Every June 24, Catholics in the country observe the feast day of Saint John the Baptist. Many barangays nationwide, especially those named after the saint, celebrate the feast by dousing their neighbors and passersby with water. Devotees, because of their panata or vow to the saint, or perhaps as a way of thanking him for blessings received, smear their entire bodies with mud, and then wrap themselves in banana leaves, tied end to end, to make sure their identities are kept secret. They then go around, knocking on doors to beg for candles or money to buy candles to be offered to the saint during the Mass at church. After the Mass, everyone removes the banana leaves to reveal himself or herself and participate in the procession in honor of the saint. Others say the ritual started in World War II when Japanese soldiers wanted to take revenge on the village whose residents they thought killed fellow soldiers. As the Japanese soldiers were about to execute all the males in the village, it rained so hard that the prisoners had to be brought into the church. Supposedly, the Japanese soldiers had a change of heart and freed the men instead. The village attributed this miracle to their patron saint. 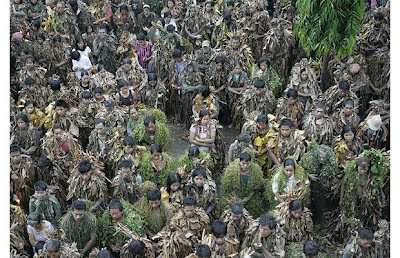 Thereafter, the villagers vowed to celebrate his feast day by wearing costumes patterned after the saint’s, but using native materials like banana leaves. Every Black Saturday, “witches” from all over the country descend on Barangay San Antonio in Siquijor, Siquijor, for a grand meeting. What people believe as witches, however, are really herbalists, locally known as albularios, who come from all over the Visayas and Mindanao to recharge their healing powers. They usually gather at Crocodile Hill, overlooking the Bay of Lazi and Mindanao Sea. According to those who have been able to witness the ritual, these healers merely throw in tree barks, herbs, insects, roots of certain crops, into a giant vat of coconut oil, roiling to a boil over fire. Participants in this annual “Witches Festival” invoke the spirits and other mystical forces by saying ritualistic verses in a rhythmic monotone believed to energize the brew and give its handlers the power to heal. The “witches” then dip their flasks or containers into the brew to take home and use in their treatment of the ill.
Siquijanons say the ritual takes place during Black Saturday because this is the time Jesus Christ has yet to rise from the dead and thus, supernatural forces are able to go about freely and share their gifts of healing with humans. Due to Siquijor’s relative isolation from the rest of the Visayas and Mindanao, and perhaps due to their level of education, the locals still believe in mananambals (herbalists) or mangbabarangs (black witches). As such, the festival has taken on an occult or mystic feel. But festival participants insist they are nothing more than ordinary people given the gift to heal. El Nido, Palawan, is well known for its bird’s nests prized in Chinese cuisine, as well as its diverse marine ecosystem. But it is also famous for its high incidence of malaria cases. To kick off an anti-malaria campaign, the El Nido Foundation mounted the very first Pista ng Kulambo (Feast of Mosquito Nets) in 1999. Since then, the festival is held every first or second week of December, and serves as the culminating activity for the year for the town. The foundation believes that the festival helps reinforce malaria awareness and encourage people to use “impregnated” mosquito nets. That means that the mosquito nets are immersed in insecticide and air dried before being put to use. While there are medicines to protect or treat people ill with malaria, these are usually expensive. The cheaper alternative is to use mosquito nets to prevent from being bitten by these nasty flying insects. Organizers of the festival usually come up with a lot of gimmicks to enable the residents of the 18 villages in El Nido to use their mosquito nets creatively. There have been contests on the best-dressed in a mosquito net, the biggest net, or the smallest net, etc. Aside from bringing out the creativity of the residents of El Nido, the annual festival has enabled the town to dramatically reduce its malaria cases by over 80 percent since it was first held in 1999. Now isn’t that a good reason to celebrate? 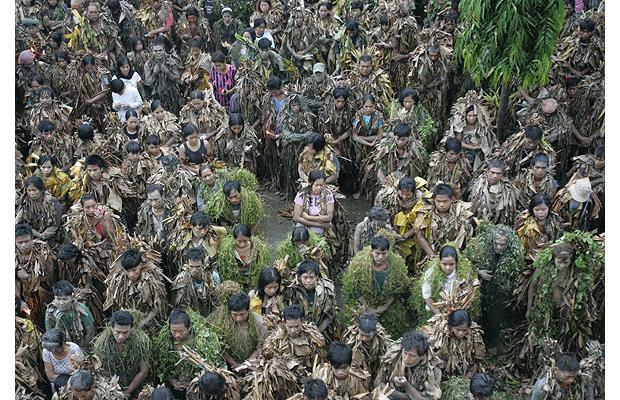 But one doesn’t have to go far into the provinces to see unusual festivals. Mandaluyong City, for example, has its own feast of the odd—a Lavandero Festival. The City Administrator’s Office created the festival in 2000 celebrating a traditional means of livelihood in old Mandaluyong during the Spanish era and right until after World War II. This was when Pasig River was still clean and teeming with fish. “Mandaluyong was known for its men who supported their families while washing clothes. Many of them were able to send their children to college by being laundrymen. In fact two of Mandaluyong’s mayors used to be laundrymen—Pedro P. Cruz in the 1940s and Isaac Lopez in the mid-’50s. And I found out that the men’s way of washing clothes is very much different from the women. Hinahataw nila sa bato, tapos pinipilipit. [They whip it against the rocks or stones by the banks of the Pasig River then twist it],” says Jeffrey Sison, who first mounted this festival. Women, on the other hand, wash clothes by rubbing the front of their fists against each other, then wringing the water out. During the Lavandero Festival, male residents dress up in a typical washerwoman’s attire, a red or maroon patadyong with a white hand towel wrapped around their head. Imagine the delight of onlookers to watch these macho men dancing during the parade carrying a washbasin and a wooden palo-palo! Exciting contests and shows are held by the banks of the Pasig River as part of the festivities. As in most festivals, even these odd ones are celebrated with typical Filipino charm, humor and creativity.